At 5:30 a.m., the Granville chapter of the FFA left from the Crossgates Mall parking lot and set off on its way to Louisville, Ky.
On the drive to Kentucky, the buses stopped at several places along the way. The group stopped at the Grape Discovery Center in Erie, N.Y., Lincoln Electric in Cleveland, Ohio, the Rupp Seed Company in Wauseon, Ohio, Findlay University in Findlay, Ohio, and Cooper Farms in Fort Recovery, Ohio. All of these stops were full of valuable information that the students could actually use in all agricultural aspects. When the FFA got to Louisville, the Farm Business Management team competed on the first day, and the rest of the group went to the National Corvette Museum in Bowling Green, Ky. The next day, the Farm Business Management team competed again, but everyone else was able to enjoy the first and second sessions in the Freedom Hall of the Kentucky Exposition Center. 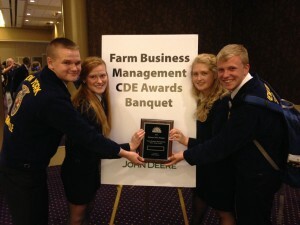 On Friday, it was announced that the Farm Business Management team won four silver medals and a silver plaque for the team. The national convention is a great way for students to meet other students from all 50 states, Puerto Rico and The Virgin Islands, who share similar aspirations and make new friends. The 2013 National FFA Convention was a record-breaker, with over 63,000 students attending. This makes it the largest student convention in the world and second in size only to the Republican and Democratic Conventions.